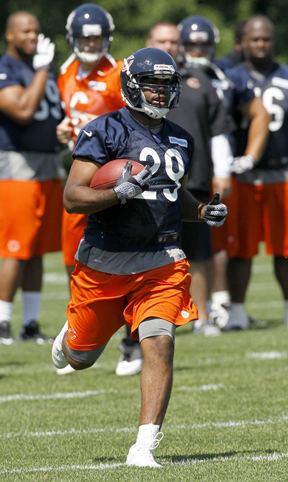 LAKE FOREST, Ill. (AP) — The Chicago Bears opened minicamp, and one key piece remained missing — Matt Forte. The Pro Bowl running back was absent Tuesday as expected, with his franchise-player tender remaining unsigned. So the staredown with management continues, and coach Lovie Smith seems to be staying out of it. Asked if the situation bothered him, he said, "It's not an issue for me and it can't be." "During the course of the year you have guys who aren't here for whatever reason," Smith continued. "You coach the guys who can go, who can practice. We've been spending all our time with that. I know Matt Forte. I'm sure he's getting ready to go. But in the meantime, the best thing we can do for the Chicago Bears is just keep this train going, which we've done." Forte hasn't signed his $7.74 million tender, and he has a July 16 deadline to agree to a multiyear deal with more guaranteed money. He is not required to attend minicamp because he's not under contract, and Smith insisted he's "having a blast" coaching the players who are. He wouldn't say if he expected Forte's situation to be resolved by now or in time for training camp next month. Either way, it's a big issue for a team with high expectations. The Bears believe they have the talent to compete for an NFC championship after a big shakeup following a disappointing 8-8 finish. They fired general manager Jerry Angelo and replaced him with Phil Emery. They shook up their coaching staff, promoting Mike Tice from line coach to offensive coordinator to replace the departed Mike Martz. And they made several big roster moves, none bigger than the trade for Pro Bowl receiver Brandon Marshall with Miami. It would help if they had Forte in the mix. "We'd love to have him," quarterback Jay Cutler said. "Hopefully we get him for training camp but if we don't, we've got to move on. It's part of the business. I don't think anyone is worried about Matt coming in and not being able to learn the offense or being out of shape. I think he picks things up really quickly. He's a smart guy. He's going to come in in shape. So it's just a matter of time if and when we get the guy." Forte sought an extension last year, but negotiations went nowhere. He wound up making the Pro Bowl for the first time, finishing with 1,487 yards from scrimmage and 997 rushing, but his season ended with a sprained medial collateral ligament in his right knee in a loss to Kansas City on Dec. 4. By then, the Bears had lost Cutler to a broken thumb and were in the middle of a freefall that knocked them out of playoff contention. They're deeper now, and they believe they have a potentially explosive offense. Cutler, Marshall and new quarterbacks coach Jeremy Bates were part of one in Denver, and they believe they can be even better this time around. "The communication across the board has been fantastic," Tice said. "Among the players, and between the coaches and the players, you see a good rapport, and that's always important. At the end of the day, we're all in it together and we're all trying to do one thing, and that's win the championship. We need them, they need us, and if we work together toward that goal, we'll be successful." A big part of that is Forte. The Bears believe they can get by if he holds out after bringing in Michael Bush, but they envision the two anchoring a deep running game. "I think you need to have two good backs, and we have two good backs," Tice said. "Of course, we love Matt, and we're excited about having Mike, and we like (Armando Allen), too. We're excited about our blend back there. We think that they all complement each other, and I think they're all going to be able to find their niche and make big plays for us." NOTES: LB Brian Urlacher (left knee) and WR Alshon Jeffery (lower leg injury) sat out on Tuesday. Urlacher was injured in the final regular-season game and has not practiced during the offseason. "He's not ready to go yet," Smith said. "He's on pace. Our plan was to take it slow with him. " He said Urlacher should "be good to go for training camp." As for Jeffery, Smith said, "Hopefully he'll be able to do something before this minicamp is over." ... The Bears waived CB Donovan Warren.